Days after the police brutality, terror looms large across the town and villages surrounding the Sterlite plant. On June 3, at least 5,000 people walked in silence with the body of a schoolgirl, J Snowlin, in the scorching heat, amid wailing friends and relatives, with a band playing a farewell song. Some fainted on the way, quickly carried away by volunteers. 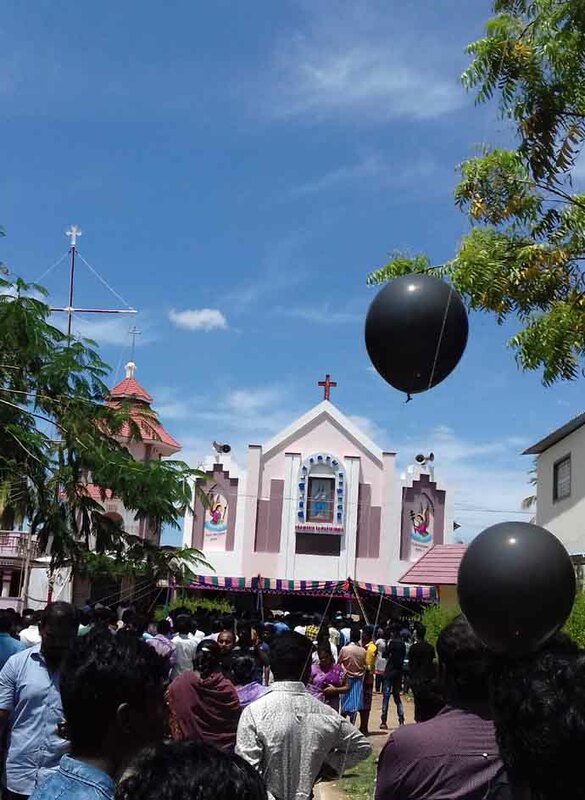 At the Sahaya Annai Church at Lionstown, with her body in the coffin and flowers hiding her face, it was a solemn occasion, replete with collective tragedy and anger. Snowlin was shot dead at the Collectorate by an unknown sniper on May 22, as a mass procession of peaceful protestors moved towards the district collector’s office, to hand over a petition. A bullet entered her neck and smashed her face. That is why, the flowers in her coffin were hiding her face. Locals are convinced that many of the killings were allegedly targeted. Tamilarasan was the coordinator of the anti-Sterlite movement. Snowlin was at the forefront of the Madha Koil protest. Maniraj was the organiser at Damodar Nagar, and Gladston coordinated the rally at Metupatti. They were all shot dead — reportedly by the snipers, on the head or chest. Alleged targeted killing was also reported in Terespuram, a fishermen’s colony. A 47-year-old woman, an anti-Sterlite leader who did not participate in the rally on May 22, was on her way to her daughter’s house in the neighbourhood. She was shot in her head — her face was destroyed. Terespuram was not under Section 144, as was the area near the Sterlite plant and the Collectorate. So why did the cops shoot to kill her? The Tuticorin police and district administration were on tenterhooks on June 3. The entire top brass was holed up at the Collectorate. The district collector and superintendent of police, who held charge on May 22, have been transferred. The industrial hub was tense, simmering with rage and sorrow. 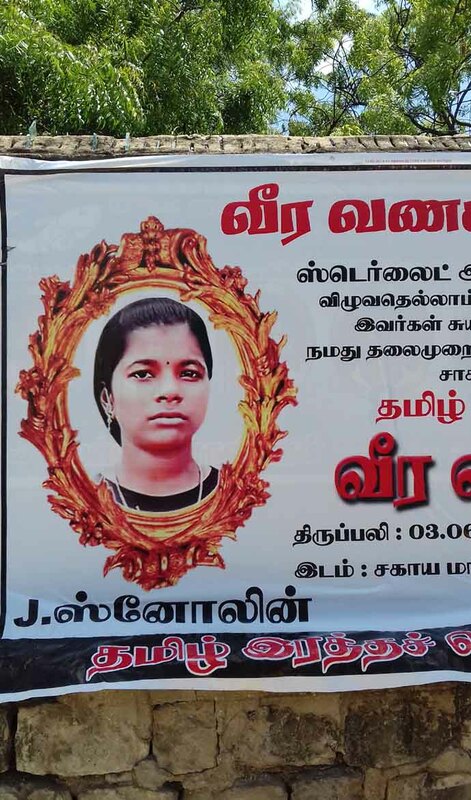 Across the town were splashed huge posters announcing the funeral with the following message in Tamil (loosely translated): “She is dead, but we are not defeated. We will rise again, until Sterlite is forced to go.” No wonder, there was not a single cop accompanying the funeral procession. Snowlin was one of the young leaders of the mass protests, which originated in thousands from lanes, bylanes and villages, walking across miles to escape police barricades. She was one of those who led the rally onto the Tirunelveli Street, close to the Third Mile Bridge, which is adjacent to the "gateway" to the collector’s office. The first killings happened here on May 22. A woman in Anna Nagar went with her daughter and son to the rally. She said that Snowlin told her moments before she was shot dead that “we have to fight for our generation and the future generations”. “She held onto my daughter as she fell, her face smeared with blood,” said the woman. Did she see who shot her? “No,” she said. Snowlin was with three of her school friends, according to those who saw her there. Her friend, Infanta, just about escaped, when a bullet, again, fired from an unknown area, perhaps from a height, by an unknown sniper, almost grazed her. Another school-going friend had her hand twisted so brutally by a cop that her hand is in a plaster cast. I saw her picture with an activist, she, smiling, despite the pain, her hand in a plaster cast. Can I take this picture, I asked? The activist refused. She said the schoolgirl does not want to share it — the cops will then file false cases against her, as it has done against hundreds of others, mostly youngsters. Days after the firing which killed 13 people, in a largely peaceful protest with women carrying their children along and packing basic food and sheets for a prolonged non-violent dharna, the death toll has gone up to 15. Terror looms large across the town and villages surrounding the Sterlite factory, which has been ordered to “permanently” shut down by the Tamil Nadu government, which defended the killings. Even after May 22, there have been police atrocities all over the localities, young men are picked up randomly, beaten up for many hours, detained on fake charges, and, sometimes, allowed to leave with the threat to keep their mouth shut. Around 95 people, mostly youngsters and teenagers, were picked up on May 22 morning. They were illegally detained at South Police Station and SIPCOT Police Station. They were reportedly stripped, made to sit in only their underwear, assaulted, kicked and thrashed. No food or water was given to them until May 23 evening. Many of them had their limbs swollen and were found limping. A police inspector, Hariharan, from the SIPCOT Police Station, has been named in this case, as in many other cases of illegal detention and torture, by locals. His notoriety across Tuticorin is legendary. Locals allege that “he is on the payroll of Vedanta”. He was transferred on June 2 from the SIPCOT Police Station to Madurai. At the intervention of the Tuticorin Bar Association, the principal district judge gave directions for the magistrate to visit the police station to enquire about the 95 detained persons. The police shifted all these men to the Vallanadu Shooting Range, thereby deliberately deceiving the magistrate. Finally, when the magistrate reached the firing range, he found that 30 of them were minors/juveniles. He ordered their immediate release. Members of the Tuticorin Bar Association informed this columnist that the district judge released 366 innocent people who were falsely detained without any bail or surety after a marathon court session which stretched till late night. The entire Tuticorin town seems to be proud of the Bar Association and is full of praise for the extraordinary woman judge, V Charuhasini, who has since retired. On May 23, as hundreds gathered at the general hospital where the dead bodies were kept, the police randomly lathi-charged, used rubber and metal bullets, barged into homes, smashed cars, windows, doors and two-wheelers, and beat up all and sundry, including mothers and sisters. This was most prevalent in Anna Nagar, which is close to the hospital on the main road, though at quite a distance from the Sterlite smelter plant. One person, Kaliappan, was killed by the police. This columnist heard several eye-witness accounts of residents in Anna Nagar. A young woman’s little children were not spared. She said, in tears, that 15 cops entered her house, threw her two-year-old daughter on a wall, and when her five-year-old brother rushed to his little sister, they stamped his chest with boots. Two of her family members, both educated, young men, were taken to the police station, their hands tied to the window, and beaten up for hours. There are scars all over their bodies now. A young boy was targeted by cops, and asked to locate an address. As he walked along, he was taken to a police vehicle and then assaulted. “For two days the police were coming again and again, shooting rubber and metal bullets at random, breaking open doors, barging into homes and beating up people. They were searching door to door and would beat up and pick up all young men, come what may, though most of them had nothing to do with the rally,” said a young girl who works in a bank. At KVK Nagar, three young men were talking in their verandah, when the cops took them away. They assaulted them for almost 24 hours inside the police vehicle, with no medical relief, food or water. “A car was burning in the distance. So the cops said, book them in this case,” said one of them. A father sent away his young son before May 22 to another town. He came back on May 29. He was picked up while he was riding a bike. He is still in jail. Similarly, in a village close to the Sterlite factory, Meelavittan, where women are in the forefront of the peaceful movement, cops in mufti arrived at 3am in the morning on May 31 and randomly picked up three young men. One of them was going to Kuwait for a job. The women went to the district collector next day. He said they will be released in an hour. They are still in the Palayamkottai Central Prison. It is confirmed from local sources that hundreds of injured are still hiding with their injuries, refusing to come out, afraid that the police will book them. The general hospital did not register police atrocities as the reason behind the injuries in many cases. Private doctors prescribed medicines without assigning the reason behind injuries. Some of them simply mentioned: “Blunt injuries.” Several FIRs have been lodged and clubbed together against scores of "innocents" to "crush the movement", said community leaders. This pre-announced "rally" on May 22, with a strength ranging between 50,000 and 70,000 people, was the culmination of protracted non-violent protests for 99 days demanding the shut-down and removal of Vedanta’s Sterlite copper smelter plant in Tuticorin. People have been up against the smelter plant which produces more than 40 lakh tonnes of copper since the past two decades. There is no medical evidence to prove it, but almost the entire town is convinced that various diseases have stalked the population, including cancer, heart problems, skin and breathing diseases and 24 -hours itching due to air, water and ground-level pollution generated by the plant and the waste it disposes. The water in the villages close to the Sterlite plant is dirty yellow and undrinkable. Amid bouts of stomach and other medical problems faced by schoolchildren, even villagers are forced to buy mineral water from the market. Significantly, this columnist witnessed square white patches on the bodies of several men and women, which spreads into shapeless patches across the body. Locals call it the “Sterlite patch”. Doctors outside Tuticorin have advised patients to move out of the area. So much so, there are reports that people in other towns and villages are refusing to get their sons and daughters married here. Allegations that "outsiders or extremists" initiated violence has been denied by all the parties and associations here, including the Tuticorin Bar Association and merchants' associations. Prof Fathima Babu, who has led the peaceful struggle since the beginning, pointed out that the district administration had agreed in a meeting with various organisations on May 20 (in which district collector N Venkatesh was absent) that the rally can be held at the SAV Ground on May 22. “The whole town was prepared to go to the Collectorate on the 100th day. However, we were concerned with the safety of the women, children and others. So, we agreed to hold the peaceful rally at the SAV Ground. However, there was massive barricading and people were stopped at their localities and villages and not even allowed to enter the ground,” she said. Thereby, the scattered crowd started moving towards the Collectorate. Significantly, both the district collector and SP Mahendran were reportedly not in town on this crucial day of mass protests. There are unconfirmed reports that the police firing order was finally given by three deputy tehsildars with magisterial powers. Section 144 was imposed near the Sterlite plant and the Collectorate. However, except a few places, no announcement was made by the administration. The collector did not communicate with the people at all during the 99 days of protests. No warning was given on loudspeakers or otherwise. TV scrolls late at night did not help. No tear gas, water cannons or lathicharge was used. The first killings, allegedly, were by the snipers. And why did the police kill people where there was no Section 144 imposed, as in Anna Nagar and Terespuram? There is nothing normal in Tuticorin now. The wounds are deep, irreconcilable and simmering. The terror machine of the state backed by Sterlite has taken a pause, but their character is out in the open. And, yet, one thing is certain: People will not rest here until they get justice. This generation, and the generations to come. Amit Sengupta is a journalist and writer based in Delhi.